Marie married Louis I, son of John II of France, in 1360. Throughout their marriage his official titles increased, though he would never actually rule the Kingdom of Naples. After his death in 1384, most of the towns in Provence revolted against her son, Louis II. Marie pawned her valuables and raised an army. She, her young son and the army went from town to town to gain support. In 1387 Louis II was formally recognized as Count in Aix-en-Provence. She then appealed to Charles VI of France to support her son in obtaining Naples. In 1390, Louis, supported by the pope and the French, set sail for Naples. Marie negotiated for a marriage between Louis and Yolande of Aragon, to prevent the Aragonese from obstructing him there. They finally wed in 1400. Marie was an able administrator and on her deathbed revealed to Louis that she had saved the amount of 200,000 écus. This was to make sure that she could pay his ransom in case he was captured. ^ Rohr 2016, p. 17. ^ Rohr 2016, p. 20. ^ a b Potter 1995, p. 374. 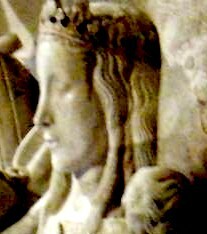 Joan of Penthièvre or Joan the Lame reigned as Duchess of Brittany suo jure together with her husband Charles of Blois between 1341 and 1364. Her ducal claims were contested by the House of Montfort, which prevailed only after an extensive civil war, the War of the Breton Succession. After the war, Joan remained titular Duchess of Brittany to her death. She was Countess of Penthièvre in her own right throughout her life. Margaret, Countess of Anjou was Countess of Anjou and Maine in her own right and Countess of Valois, Alençon, Chartres and Perche by marriage. Margaret's father was King Charles II of Naples, whilst her husband was Charles of Valois, and her older brother was Saint Louis of Toulouse; her nephew was Charles I of Hungary. Frederick (Ferry) II of Lorraine-Vaudémont, was Count of Vaudémont and Lord of Joinville from 1458 to 1470. He was son of Antoine of Lorraine, Count of Vaudémont and Lord of Joinville and Marie of Harcourt, Countess of Harcourt and Aumale, as well as Baroness of Elbeuf. He is sometimes numbered Frederick V by continuity with the Dukes of Lorraine. Jeanne de Laval, was the second wife and Queen consort of René I of Anjou, King of Naples, Sicily, titular King of Jerusalem, Aragon, and Majorca; Duke of Anjou, Bar, and Lorraine; and Count of Provence and Piedmont. Yolande of Brittany was the ruler of the counties of Penthièvre and Porhoet in the Duchy of Brittany. Yolande had been betrothed to King Henry III of England in 1226 at the age of seven years. but married Hugh XI of Lusignan, the half-brother of Henry III. Through Hugh, she became Countess of La Marche and of Angoulême. She was the mother of seven children. From 1250 to 1256, she acted as Regent of La Marche and Angoulême for her son, Hugh XII of Lusignan. Margaret of Savoy, was a daughter of Amadeus VIII of Savoy and Mary of Burgundy. By her three illustrious marriages, she held a number of titles, including Duchess of Anjou, Duchess of Calabria, Countess of Maine, Countess of the Palatinate, and Countess of Württemberg.